Earn up to 3,584 reward points. Vast selection of soloing string samples. Solo Strings I Full version is an extensive collection of solo string samples,105,956 in all. Christian Eisenberger, Katharina Traunfellner, Rubn Dubrovski, Martin Deuring. These four soloists have invested their life's blood and hard-won experience (from many years of international concert work) into the Vienna Instruments. Sensitive and clear, exact and homogeneous, their performances are technically perfect and utterly convincing in their musicality. Not only are these fine musicians in command of their instruments but, after several years of working for the Vienna Symphonic Library, they also know exactly what is required of them to create ideal samples. Their performances at the Silent Stage come alive again in this Vienna Instrument. 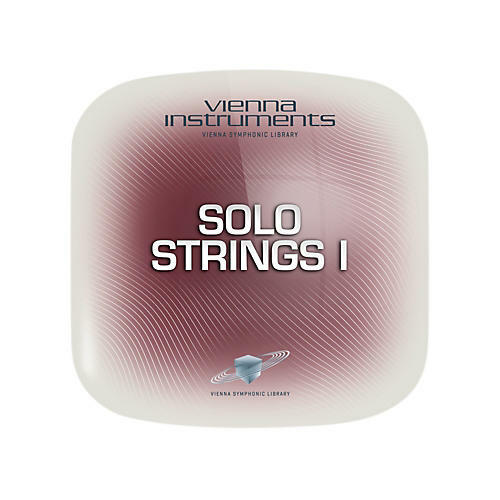 Solo Strings I is the most comprehensive and sophisticated solo string edition ever created. This Collection contains articulations such as "Zigane", the leisurely "smeared" portamentos, which are particularly impressive as Interval Performances with the Vienna Instruments audio engine's algorithms. Additional "harsh" articulations are played with an especially raw, almost brutal attack, and are now available as superbly effective Interval and Repetition Performances. There are also special Performance Trills, repetitions in spiccato and ricochet articulations, sustains with fading vibrato, ponticello, sul tasto, and numerous natural and artificial harmonics. The Solo Strings I Full Library contains 87 GB of uncompressed sample data in 44.1kHz/24-bit. Due to an innovative optimization process, the Vienna Instruments engine decompresses the samples in real-time, so that they take up only 58 GB of space on your hard disk. Order now to complement your string library.